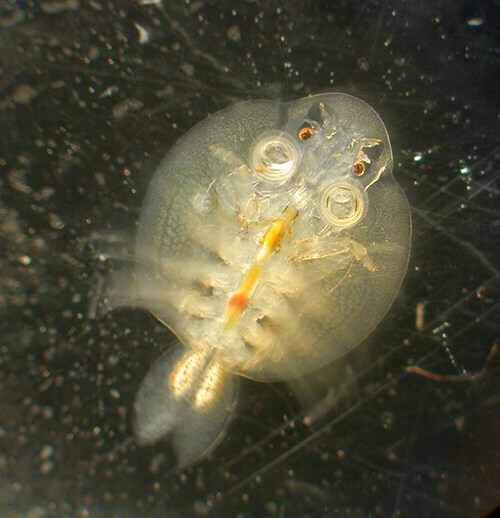 Argulus, which is also referred to as Fish Louse, is a parasite that is common among fish. It has the shape of a disc which is flattened, and resembles a crustacean. Upon becoming adults these parasites can be seen without magnification, and can reach sizes of 10mm. When coming into contact with fish Argulus will form an attachment to either their fins or skin, and will begin feeding on their blood. It accomplishes this through the insertion of a stylet which has suckers, hooks and barbs. These cause additional damage aside from the blood loss. Over time lesions which are red in color will appear on the areas of the fish where Argulus feeds, and may develop additional infections resulting from Costia or white spot. Argulus females will also place eggs on pond plants and other objects which are submerged. In order for their eggs to hatch the water temperature must be higher than sixteen degrees Celsius. It takes between three and four weeks for eggs to hatch during summer and they can overwinter when the weather turns cold, hatching during spring. Upon hatching juvenile Argulus must locate a host within four days. This bacterium has a total life cycle of between thirty and one hundred days based on the surrounding temperature. The most common symptoms that fish afflicted by Argulus will display include rubbing themselves against the walls of an aquarium or pond, which is an attempt to rid themselves of it. They may also display fish flashing. As the infection becomes more advanced the fish will eventually become lethargic, and their gills, skin or fins will excrete mucus. The best method for treating Argulus is with organophosphates, however, it is banned in some countries such as the United Kingdom. Alternative treatment methods include Emamectin or Diflubenzuron. Emamectin should not be used with certain species such as Rudd, Sturgeons or Bream. Another option is a simple salt bath, which can work well for lone fish. It can be removed manually via tweezers, but one must exercise caution, as the fish will experience pain and may need to be given anesthesia beforehand. Once the parasite has been removed the wound will need to be treated through usage of gel and antiseptic to prevent secondary infection. It is also possible to use Malachite green. For pond or aquarium owners that have infected sturgeon, a basic salt bath is the wisest course of action, as other treatments can cause greater harm. The reason for this is because sturgeons are well adapted to salt water, and they withstand more of it than koi or other species. When used in high doses certain types of salt are highly effective against Argulus. While a salt bath can also be used with freshwater fish, it must be done with caution as higher dosages can be harmful to them. It is recommended to use no more than 15gm for each liter for about thirty minutes.